Chris Castro serves as the Director of Sustainability for the City of Orlando, as well as on the board of several solution-oriented non-profits. 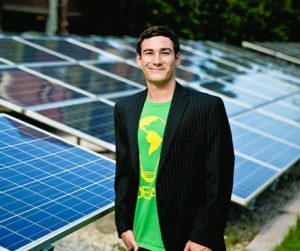 He has advised on the growth of Solar United Neighbors of Florida’s board, programming, attended events and participated in our 2nd annual Solar Congress. As a young leader enhancing Florida’s resiliency, he is featured in the thought-provoking documentary, Paris to Pittsburgh. He speaks to the power of clean jobs and renewable energy to combat the environmental and economic issues faced in our state. Chris was also an integral part is Orlando’s securing of a $2.5 million dollar grant as a Bloomberg American Cities Climate Challenge awardee. Perhaps most applaud-worthy of all, he was named one of Governing Magazine’s 2018 Public Officials of the Year. 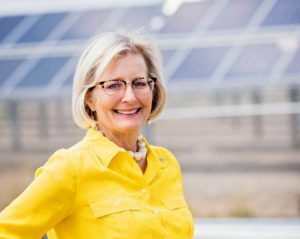 Deirdre Macnab has had a busy year serving not only Solar United Neighbors of Florida, but also assisting in the expansion of our network to Colorado. Deirdre’s has led and supported advocacy campaigns, widespread growth of electric vehicle (EV) education in Florida and, as always, spreading solar growth in Florida. From speaking at the Capitol to celebrating solar at the Orange County Solar Celebration, Deirdre is a ray of sunshine to our program. Dr. Rick Garrity led two highly successful co-ops in Hillsborough County, then set his sights on his home in Polk County. He assembled a rockstar team to lead the Polk County Solar Co-op and Polk County Solar Tour, as part of the National Solar Tour. 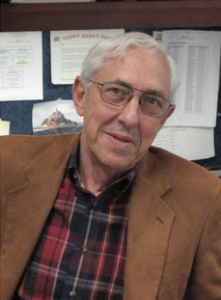 Dr. Garrity has developed lasting partnerships with the county, municipalities, and organizations already working in the area. His leadership extends far beyond helping neighbors save money with solar energy. He is leading the charge to educate and advocate for rate payers facing punitive price plans in Lakeland. While the dialogue with the City Commission and Lakeland Electric is ongoing, fellow residents are lucky to have Dr. Garrity’s passion and energy advocating for their rights. 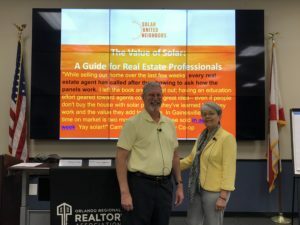 Michael and Mary presenting solar to realtors. Mary Dipboye and Michael Cohen have been with us since the beginning and continue to be invaluable assets to our program. Mary has provided support and guidance to fledgling co-ops throughout the state; while Michael has literally traveled throughout the state to present co-op information sessions. 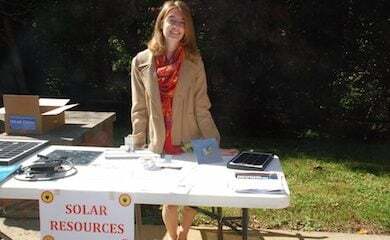 Mary continues to increase our collaboration with other groups and explores creative solutions for non-profits and churches looking to go solar. Most exciting of all, Mary and Michael assisted in developing and deploying our first Realtor Training Course. These two are the bedrock of our advisory board and are always expanding and growing our program.